Hey, my name’s Sam and today I’m going to run you through the amazon barcode requirements. I’ve been a full time FBA seller for some time now and until recently, I didn’t realise how many people were unsure about amazons barcode requirements. It was brought to my attention by some viewers who watched our “Creating Your Amazon Private Label Listing” video. In the “Creating Your Amazon Private Label Listing” video I mentioned where you need to insert your barcode when creating an amazon listing. Whilst explaining this, I briefly highlighted the importance of purchasing the correct type of barcode. Well, I wasn’t prepared for the foray of messages asking us all sorts of questions about barcodes for amazon. Instantly, I felt obliged to get something together to clear everything up. Because it appears many people are unknowingly putting their Amazon listings and business at risk! So, here I am, bringing you a 3 part YouTube mini series and blog post all about the ins and outs of Amazon Barcode Requirements. 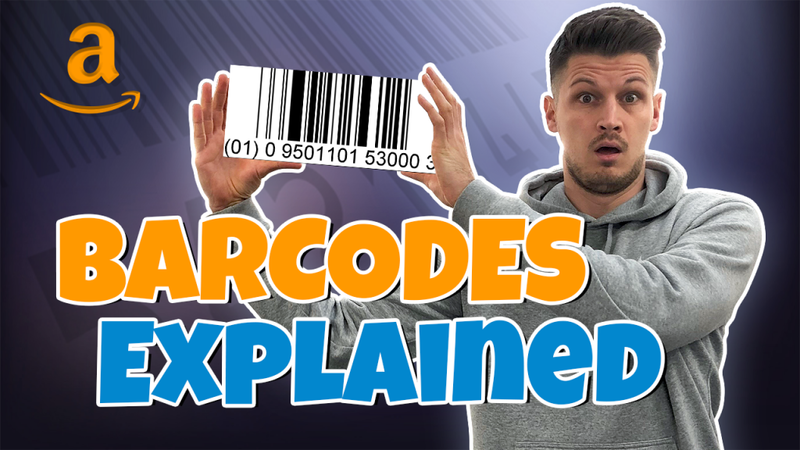 Part 1 – I run through what type of barcodes you need for amazon and where to buy amazon barcodes from. Part 2 – Looks into what a FNSKU barcode is and why you need it for amazon fba. Part 3 – I tell you how to generate a FNSKU and where to place FNSKU labels on your product/packaging. Part 1 – How to get a barcode for Amazon… that you can trust! First of all, if you’re a Retail Arbitrage, Online Arbitrage or Wholesale Amazon seller, then you can skip to part’s 2 and 3. This first part is solely related to Private Label sellers, looking for answers on where to get barcodes for amazon listings. So PL sellers, generally speaking you have two options on where to get your amazon barcodes from. Option one, I am going to refer to as ‘buy a barcode’ websites, whereby I mean websites that are literally called “buyabarcode”, “buybarcodes”, “getabarcode”. Okay then, so what’s the difference? To find these types of sites, you can simply type “buy a barcode” into your search engine. 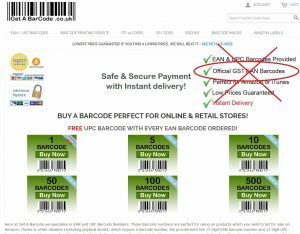 You’ll find lots of similar sites offering the same sorts of service… barcodes for sale (sorry to state the obvious). But what are the pros and cons of these? Well, why they’re popular is because essentially they’re cheap. Not only that, but they offer great discounts and offers when you buy barcodes in bulk. Which can be really appealing sellers who’re churning out lots of new private label amazon products. But also, for any new seller who might not be confident in bringing a product to market on Amazon, being able to keep costs down is bound to appeal too, right? 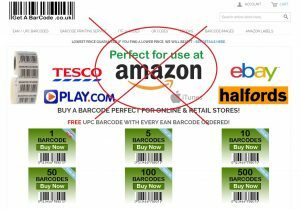 Amazon do not recommend these ‘buy a barcode’ websites! They do not adhere to Amazon barcode requirements. Even if these websites state that their barcodes are okay for use on Amazon, they are not. Using a barcode from these types of sites puts your Amazon listing at risk of being removed and shut down. As well as potential issues with your entire amazon account. To explain further, these sources are not illegal, but you run a big risk by using their barcodes. Essentially think of them as a second hand barcode. Which is essentially what a barcode is meant to be, right? Haha! Sorry, this is no laughing matter, but how backwards is that?! In order to help you understand what I mean by second hand and risky, let’s elaborate. Might be in use by another product. This product might be similar or dissimilar to yours. But that doesn’t really matter either way because it just means that the barcode isn’t ‘just yours’. It’s traceable to another product. Might not be in use anymore, but have been used in the past for an old product no longer on the market. Again, although it’s no longer in use, if anyone was to try to trace the barcode it wouldn’t link to ‘just your’ product. Might be a replicated code that isn’t even searchable within the official GS1 system. Which essentially means that it isn’t recognised as an official barcode. Finally, on the ‘buy a barcode’ options, I wanted to mention their impact on expansion outside of Amazon. You may not see yourself ever selling away from Amazon and that’s fine. But should this be of interest to you then you should know that any major retailers will not accept your product if it’s barcode is from one of these sources. They only accept GS1 barcodes. So it’s not just the impact of the Amazon barcode requirements that you should be taking into consideration. I might as well start by stating that GS1 is the only official source for barcodes. Simple. Other barcode sources/websites, including the ‘buy a barcode’ types I have already mentioned, will state that they offer GS1 barcodes. But beware, this is misleading because although they may once have been purchased from the official GS1 sites, you cannot be certain that they are unused. They could be in use on other products (as mentioned above). The only way you can guarantee that a barcode is truly unique to your product, brand and business is to purchase from the official GS1 websites. So now I’ve cleared that up, let’s cover the pros and cons of GS1 barcodes for Amazon products. Let’s start with the one major con… and that’s price! Buying barcodes from GS1 can be expensive, especially when compared to ‘buy a barcode’ sites. In business, keeping costs low is vital and so this can be why some people are put off purchasing GS1 barcodes. However, GS1 do have options on ways to save with bulk purchase discounts and yearly membership. But admittedly this will only really appeal to bigger more established sellers who’re confident of releasing many new products a year. Now, possibly the biggest pro for getting a GS1 barcode is that it is an AMAZON REQUIREMENT. This was not always the case but Amazon have now made it part of their Amazon barcode requirements policy for all sellers to use GS1 barcodes. So if you want your private label products to be safe and you want to stay in Amazon’s good books, then you need to buy GS1 barcodes. That’s the price we pay for selling our products on the worlds most sophisticated shopping platform. Forgetting Amazon for a second, the glaringly obvious benefit of getting a GS1 barcode is that the barcode will definitely be ‘yours’. Any barcode purchased from GS1 is 100% unique to your product, your brand and your company. They provide you with the correct company prefix and certification, whilst of course documenting everything officially within their GS1 database system. It’s your barcode and nobody else can use it! Finally, with the previous point considered, this means that you have the option to branch off and expand away from Amazon. Whether that is your own store, or more importantly selling your products with major retailers, you know you have a barcode that is only traceable back to you. Significantly, having a GS1 barcode means that all major retailers will actually accept your product. It’s what will be used to identify your product and what will be scanned at the tills in Walmart or Tesco. So whether it’s in your plans or not, you know that expanding beyond Amazon is not an issue. And hey, all the big business icons will say that diversification is key! So in summary, what do I think is the way to go when you’re trying to decide how to get amazon barcodes? PRICE! – If it comes down to price and that’s what is going to be the deciding factor, then maybe you should go for the ‘buy a barcode’ sources. They’re cheap and you can get them even cheaper if you buy in bulk. DO YOU WANT TO DO THINGS PROPERLY? – If you’re like us and you’re all about doing things properly then GS1 is a must for you. With GS1 you know you’re adhering to Amazon’s TOS (terms of service) and specifically their Amazon barcode requirements. You have an official barcode that is unique to your product, which also means you can expand and sell away from Amazon too. OUR RECOMMENDATION! – Think long term, just pay that bit more and get GS1 barcodes from the official GS1 sites. It’s an investment in the long term protection of your products and business. It’s a no brainer for us! So, hopefully this has offered some clarity on Amazon Barcode Requirements. You can now make an informed decision on where to buy amazon barcodes and which barcodes for amazon listings you need. Part 2 – What is a Amazon FNSKU barcode and why do you need one? Before going any further, if you’re a Merchant Fulfilled seller then STOP! Haha sorry, it’s nothing to worry about, I just don’t want you to waste your time reading these next two parts. You only need to worry about FNSKU barcodes and FNSKU labels if you are a FBA (fulfilment by Amazon) seller. As Merchant fulfilled all you need is a regular barcode (hopefully purchased from GS1 – hint hint). So FBA sellers, what is a FNSKU and why do you need one on your product? An FNSKU is essential because it is a barcode that is specifically related to Amazon’s Fulfilment Centre’s. The FNSKU is Amazon’s own unique barcode system and each one is a specific identifier that they assign to your product and your seller account. You might be thinking, okay this is great to know, but now you’re wondering how to get FNSKU code from Amazon? Well first lets see how the different selling models work in terms of actually creating a listing, which will generate the FNSKU that is linked to the product. For Private Label sellers (sellers who brand and sell their own products), you have to create your listing from scratch. You do so by entering your barcode (hopefully from GS1) and also filling in all the other relevant fields. Once you save and submit these details, your listing will be created. Then Amazon will automatically generate a unique FNSKU that is linked to your listing/product. For Arbitrage and Wholesale sellers who are looking to sell their product on an already existing listing, it’s slightly different. All you need to do is enter your price and product condition before clicking save and finish. Likewise the listing is then created and Amazon is triggered to populate a unique FNSKU for this listing that is linked solely to your seller account. Meaning Amazon can differentiate between your product/inventory and other sellers who are on the same listing. The FNSKU looks something like the example above and is essentially Amazon’s barcode system. Then the same rules apply, you need to use the FNSKU barcode on your product, packaging or outer packing (e.g. poly bag). The reason for this is because it’s the only barcode Amazon will use to scan and recognise your goods. Whether that’s when they receive your goods into the warehouse or when you make a sale and the product is scanned before packing and posting. The FNSKU is their scannable barcode that is used to identify your product. It’s the key component to FBA Amazon barcode requirements! Part 3 – How to get FNSKU code from Amazon and how to apply it to your product? So you should now hopefully be clued up on the ins and outs of GS1 barcodes and FNSKU barcodes. Essentially now knowing the difference between amazon barcode and manufacturer barcode (FNSKU and GS1). Now, you need to know how to export the FNSKU from Amazon and then the best practices for applying your FNSKU to your product/packaging. Once you’ve generated your PDF to your printing needs, you then have two options in terms of how to use the FNSKU and how to apply it to your product. The conventional method is to print off your FNSKU labels. Once printed, depending on the type of product you have, the FNSKU is then either stuck directly onto the product/packaging. Completely covering any existing barcodes (GS1 – EAN/UPC)!!! Or alternatively, if the product has been bubble wrapped or placed in a poly bag, then the FNSKU should be stuck on the outside of the wrapping/bag. If you’re an Arbitrage or wholesale seller you’ll likely do all this in house, as well as some private label sellers too. Or you have even use FBA prep centre’s based in your home country. However, Private Label sellers will often send the PDF with the FNSKU labels on directly to their suppliers and ask them to print and sticker the products. With this method, you need to ensure that you trust your suppliers to print correctly. But also vitally, that they know to apply the FNSKU barcodes so that they cover any other barcodes on your product/packaging. We realised we could eradicate the cost of time and money that comes with printing and labelling FNSKU barcodes! What we do is take the PDF document with the FNSKU on and send that PDF to our packaging designer. We get them to take the FNSKU from the PDF and place it onto the packaging design instead! This way, when you send your packaging design to your supplier to print, it already has the FNSKU barcode on it. Therefore, there is no need for labelling by the supplier, a prep centre or an in house team. With that, you avoid any concerns about the FNSKU not being applied properly. Also, if you’re just selling on Amazon then you don’t need the normal (GS1) barcode on the packaging anyway. You only need it in the back end of the listing in order to create the listing. Of course, when employing this method, please ensure that your supplier has good quality printing and packaging. Whilst also making sure that your packaging designer uses the correct size and formatting when placing the FNSKU onto the packaging design. All Amazon barcodes must be printed in black ink on white. Dimensions must be between 1inch x 2 inches and 2 inches x 3 inches. So that’s Amazon Barcode Requirements in a nut shell! From GS1, to FNSKU and finishing on a handy tip on printing barcodes. Hopefully you feel a bit more informed on the whole topic of Amazon Barcode Requirements. Thanks for taking the time to read this and please leave any questions or comments below and i’ll be sure to get back to you. This is very informational content. I think barcodes should be taken seriously because everything is dependent on barcodes. As you said there can be barcodes which are already in use. They can seriously be harmful for our product. Glad you’ve enjoyed it Kaushal, i think as the years roll on more and more sellers will be aware of the importance! Hey, thanks, I am a beginner in Amazon FBA and your articles are very helpful for me. Keep up the good work.